The year before our range of years for this study, the Cardinals made it all the way to the Super Bowl, the only time they’ve ever done that. But just within the last 10 years, the team has gone from first place to last place, back to first place, and back to last place. They have two first places, three second places, two third places, three fourth places. They’ve been 13-3 and 3-13. And now, they are coming off a season that yielded them the first overall pick in this year’s draft. The point is, I don’t know the quality of the amusement parks in the Phoenix area, but the best roller coaster is located in State Farm Stadium. Let’s take a look at the best Cardinals fantasy seasons of the last decade. 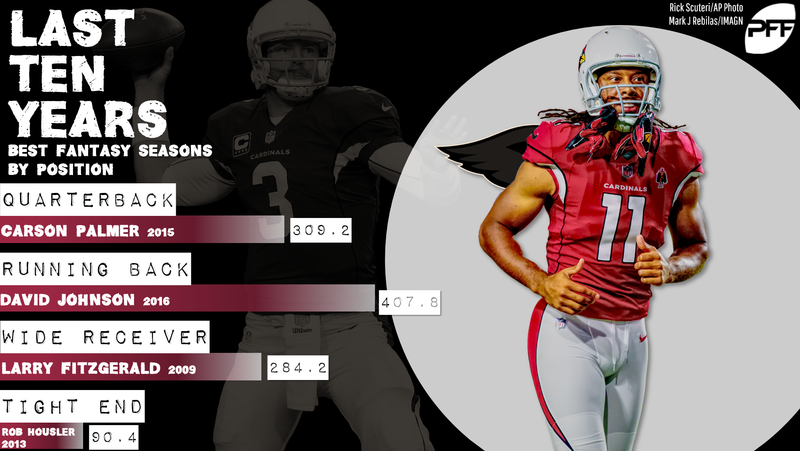 Palmer’s 2015 season was easily good enough to win an MVP. He finished with the best overall PFF grade among quarterbacks at 93.0 and led his team to a 13-3 record and a loss in the NFC Championship game that might have gone differently if he hadn’t been hurt. But with Cam Newton the flashiest player in the league and having his best season while the Panthers made it almost the entire regular season undefeated, the storylines were stacked against Palmer even as his underlying performance was arguably superior. Still, for a player who had actually retired years before, that 2015 season was a sight to behold. The only question here was which Fitzgerald season would rank No. 1 here. He has each of the top seven seasons in our sample and nine of the top 12. And it wouldn’t even be hard to argue that his three best seasons all came before our 10-year range started, as he topped 1,400 yards and 10 touchdowns in each of 2005, 2007, and 2008. The point is, Fitz is good. LOL. The best the Cardinals could do was the 28th-best tight end in a season. Charles Clay’s Bills-leading 136.2-point 2016 was the second-worst season to make this list, and Housler is nearly 50 points off that pace. Every team has fallow periods at a position from time to time, but the Cardinals haven’t had a tight end top 500 yards or score more than 3 touchdowns in a decade, and that’s just sad.